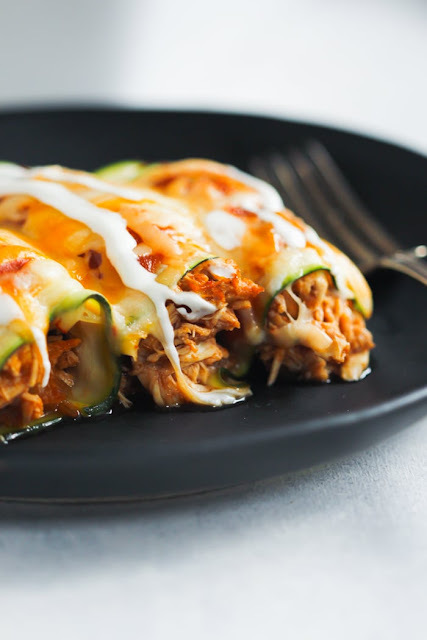 This Low-carb Chicken Zucchini Enchilada is made with “zucchini tortillas” and it’s loaded with enchilada sauce, chicken, and cheese. It’s also gluten-free and very flavorful! I love this Low-carb Chicken Zucchini Enchilada because it’s lighter than the traditional recipe and also the filling is AMAZING. In large skillet over medium heat, heat oil. Add onion and salt. Cook until golden and brown. It’s about 5 minutes. Add garlic, cumin, chili powder, shredded chicken and 1 cup enchilada sauce. Using a vegetable peeler or a mandolin make thin slices of zucchini. On a cutting board, lay out four zucchini slices slightly overlapping. Then, add two tablespoons of chicken mixture on top. Roll up and transfer carefully to a baking dish. Repeat with remaining zucchini and chicken mixture. After that, use remaining enchilada sauce to top the zucchini enchiladas. Sprinkle the shredded Monterey Jack cheese and cheddar cheese. Bake for approximately 20 minutes and until cheese is melted. 0 Response to "Low-Carb Chicken Zucchini Enchilada "